Dr. Jos� Luis Calder�n '77 (left), and Dr. Tom�s D. Morales, '78, '98, will be honored on Wednesday, Sept. 29, in the Hall of Fame Room. The University at Albany is honoring two of its outstanding Latino alumni, Dr. Tom�s D. Morales, '78, '98, president of the College of Staten Island, and Dr. Jos� Luis Calder�n '77, a champion of health care literacy, as part of National Hispanic Heritage Month. 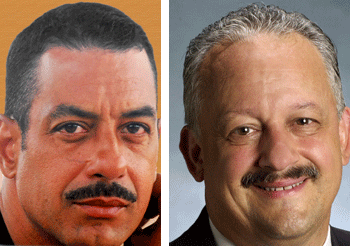 The two UAlbany alumni will be recognized on Wednesday, Sept. 29, at 4 p.m., at a special event celebrating "Nuestra Herencia �xito Latino" -- "Our Heritage and Latino Success." The event will be held in the Hall of Fame Room at the SEFCU Arena. "Both of these outstanding graduates are a testament to this institution's long commitment to inclusion and equal opportunity," said University at Albany President George M. Philip. Morales earned master's and Ph.D. degrees from UAlbany in educational administration and policy studies. After several years as assistant vice president for student affairs at SUNY New Paltz, he became vice president for student affairs at the City College of New York, CUNY, in 1994 and provost of California State Polytechnic Institute in 2003, before becoming the first Latino president of the College of Staten Island, CUNY, in 2007. He won an Exemplary Leadership Award from the American Association of University Administration in 2003. Calder�n was one of the first two UAlbany alumni to graduate from Harvard Medical School, in 1982. He became director of the Charles R. Drew University Center for Cross-cultural Epidemiologic Studies, and principal investigator for two U.S. Department of Health and Human Services initiatives: the South L.A. Breast Health Promotion and Diabetes Literacy and Self-Efficiency Training projects. In 2004, he was elected president of the Association for the Behavioral Sciences and Medical Education. Event sponsors include Alianza Latina and the Office of Diversity and Inclusion. 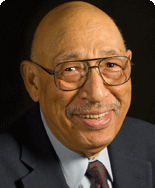 UAlbany Professor of History and Africana Studies Allen B. Ballard�s powerful voice rings out in the classroom as well as in his church choir.